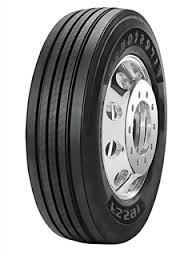 Combines low rolling resistance tread and energy-saving casing design to optimize fuel efficiency. ULTI-Rib and Side Groove designs combat the initiation and spread of irregular wear. A wider and deeper tread and proprietary shoulder design results in greater removal mileage and irregular wear resistance. Innovative sidewall design reduces overall tire weight to improve fuel efficiency without sacrificing durability.